We made the biryani with both basmati rice and Kalijira rice. Both were delicious, but we felt Kalijira rice is better than basmati rice. Kalijira, if you don’t know, is a minute version of long grain rice and is also called baby basmati, sometimes. The rice has a mouth-watering aroma when cooked which will get you addicted. I bought it from the local Indian grocery store here. But it is also available in Walmart and Whole Foods in the US. 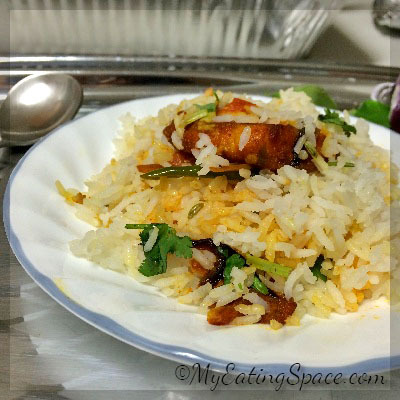 Talking about fish, you can use almost any fish, better boneless, fillets to make the biryani. My first trial was with Salmon and the second and third with tilapia fillets. Both were equally delicious. You can use the masala (allspice) powder if you want, but I didn’t. I used the spices as it is. Note: Don’t get disappointed to see a long recipe. 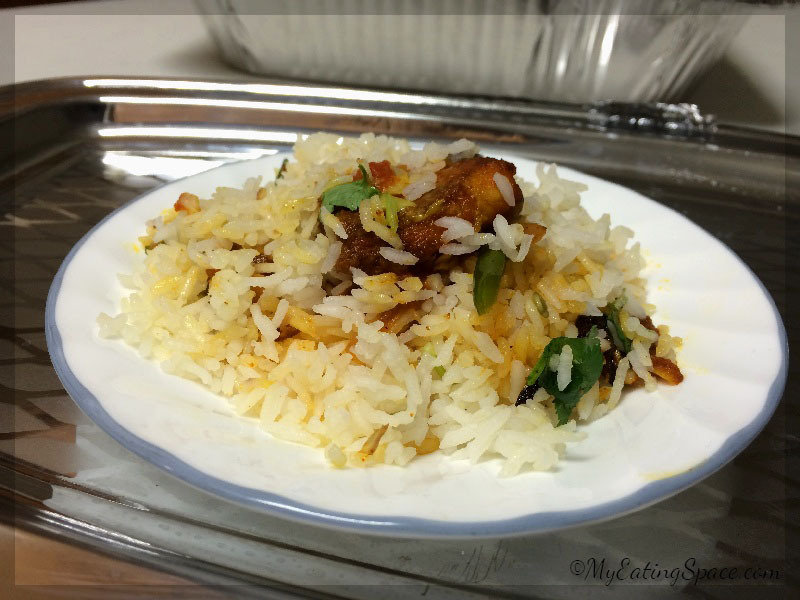 Actually, baked fish biryani is pretty simple to make. Writing down the recipe and making the dish is entirely different. So go for it. Treat your taste buds. 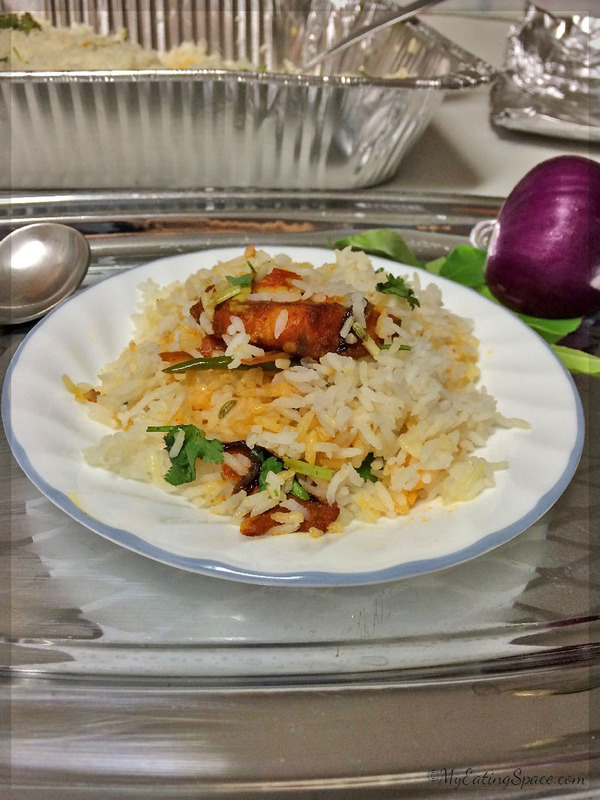 Baked Fish Biryani, a traditional Indian dish, is a baked (dum) spicy rice dish that infuses all flavors together. Once tasted, you are addicted. Mix together chilli powder, turmeric powder and salt in a plate. Marinate the fish pieces with this mix and let it sit for 30 minutes. Fry the marinated fish on medium heat until both sides are golden brown. Transfer the fish to a plate. Keep aside. To the same oil, add fennel seed, cinnamon, and cloves. Stir-cook until you get a spicy aroma. Add the chopped tomato and salt. Stir and cook until the tomatoes can be mashed. Now add the ginger, garlic, green chilli and curry leaves. Switch off the heat. Add the fried fish into the gravy. Mix gently without breaking the fish pieces. The fish gravy is ready. Keep aside. To a large vessel, add water, salt, cinnamon, cloves, fennel seed and cardamom. Cook on medium-high heat and bring to a boil. Reduce the heat to medium low and cook for 2-3 minutes. Now switch off the heat and let it sit in the hot water for 3-4 minutes. Drain the rice using a strainer. Immediately transfer to a large baking pan. Spread the rice and let it cool down. This will help to prevent over-cooking of rice. Now heat butter in a pan. Add the sliced onion and fry until slightly golden in color. Layer a baking tray or foil baking pan with a little rice evenly. Then layer it with the fish gravy, evenly. Spread the fried onions on top of the gravy. Again add another layer of rice. Sprinkle some cilantro leaves. The layering must start and end with rice. Now tightly cover the pan with an aluminium foil. Let it sit for 5 minutes before opening for the flavors to infuse. Baked fish biryani is ready. Serve hot. 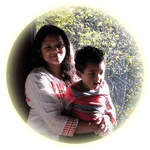 You can use basmati rice instead of Kalijira rice. Fish like tilapia or salmon would be great, but any fish will be fine. As I said this will be a royal treat for your taste buds. My family is happy as we got one more unique dish for the meal. I hope you will be glad too. Try the recipe and let me know in the comments. If you like the recipe, I hope you will share it.